Today we will be taking a look at an innovative product provided to us for review by Waffer Thermal Division. Waffer Thermal Division was created in 2001 with the goal of developing new and innovative cooling solutions for today’s high performance computer systems. So let’s take a look at one of their flagship products, the PC AirCon PAC 400. Let’s get started by describing exactly what the AirCon is. This is how Waffer describes the PAC400 on their web site. 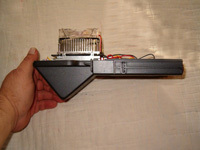 PC AirCon PAC 400, represents a new cooling concept by bringing the idea of "Air-Conditioning System" into the computer cooling. Different from the traditional coolers, PC AirCon PAC 400 is an Air Conditioner for PC's, which adopts the advanced TE (Thermoelectric) technology, providing significant advantages of Extra Cooling Power over than other conventional cooling methods. PC AirCon PAC 400, gives you lively new experience of cooling! 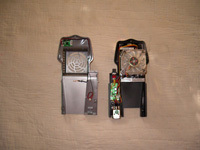 Peltier devices, also known as thermoelectric (TE) modules, are small solid-state devices that function as heat pumps. A "typical" unit is a few millimeters thick by a few millimeters to a few centimeters square. It is a sandwich formed by two ceramic plates with an array of small Bismuth Telluride cubes ("couples") in between. When a DC current is applied heat is moved from one side of the device to the other - where it must be removed with a heatsink. The "cold" side is commonly used to cool an electronic device such as a microprocessor or a photodetector. 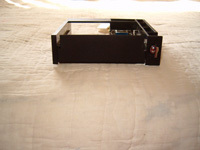 So what we have is a thermoelectric cooler sandwiched between two aluminum heat sinks, each with its own fan. 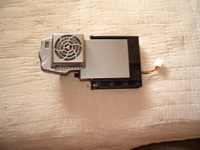 Then throw in a digital display to show the temperature of the air flowing through the unit, a switch to control the two operating modes, and a slide mounting system that occupies a 5.25” drive bay, and you have the PC AirCon PAC 400. Here are a few pictures of the PAC400 opened up to expose the internal workings. A few pictures of the slide mount that goes in the 5.25” drive bay. One very nice feature is that the PAC 400 is hot swappable. 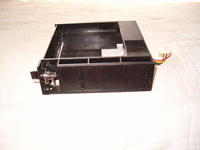 With the 12 volt power connector hooked up to the mounting bracket you can slide the main cooling unit in and out of the computer without shutting the computer off. 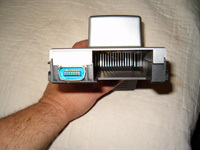 There is a power connector on the back of the unit that mates with one on the mounting bracket to power up the cooling unit. The most noteworthy item in the table above is the power consumption... 52 Watts! Make sure your power supply isn't maxed out before deciding to install one of these!